Schematic procedure for the MethylFlash Global DNA Methylation (5-mC) ELISA Easy Kit (Colorimetric). An example of an optimal standard curve generated with 5-mC standard control. Accurate quantification of 5-mC content of various DNA samples from different species using the MethylFlash Global DNA Methylation (5-mC) ELISA Easy Kit (Colorimetric). The results are closely correlated with those obtained by HPLC-MS. The MethylFlash™ Global DNA Methylation (5-mC) ELISA Easy Kit is a complete set of optimized buffers and reagents to colorimetrically quantify global DNA methylation status by specifically measuring levels of 5-methylcytosine (5-mC) in a simplified, "one-step" ELISA-like reaction. As a fourth generation technology of Epigentek's patented global DNA methylation technique, it is a further refinement of the popular, predecessor MethylFlash kit by improving upon speed, simplicity, sensitivity, and reproducibility. This kit is also specifically optimized for paired use with the MethylFlash Global DNA Hydroxymethylation (5-hmC) ELISA Easy Kit (Colorimetric) for simultaneously quantifying both methylated DNA and hydroxymethylated DNA. DNA methylation occurs by the covalent addition of a methyl group at the 5-carbon of the cytosine ring by DNA methyltransferases, resulting in 5-methylcytosine (5-mC). In somatic cells, 5-mC is found almost exclusively in the context of paired symmetrical methylation of the dinucleotide CpG, whereas in embryonic stem (ES) cells, a substantial amount of 5-mC is also observed in non-CpG contexts. Levels of 5-mC are variable in animal genomes, ranging from undetectable amounts in some insects to about 2% of total DNA in vertebrates. The level of 5-mC in plants generally accounts for 0.5-2% and can be as high as 8% of total DNA in some other species. The biological importance of 5-mC as a major epigenetic modification in phenotype and gene expression has been recognized widely. For example, global decrease in 5-mC content (DNA hypomethylation) is likely caused by methyl-deficiency due to a variety of environmental influences, and has been proposed as a molecular marker in multiple biological processes such as cancer. It has been well demonstrated that the decrease in global DNA methylation is one of the most important characteristics of cancer. A few novel modified nucleotides, 5-hydroxymethylcytosine (5-hmC), 5-formylcytosine (5-fC) and 5-carboxycytosine (5-caC) have been detected in human and mouse tissues as well as embryonic stem cells. In mammals, these modified nucleotides can be generated by iterative oxidation of 5-methylcytosine, a reaction mediated by the TET family of enzymes. This kit contains all reagents necessary for the quantification of global DNA methylation. In this assay, DNA is bound to strip-wells that are specifically treated to have a high DNA affinity. The methylated fraction of DNA is detected using capture and detection antibodies and then quantified colorimetrically by reading the absorbance in a microplate spectrophotometer. The percentage of methylated DNA is proportional to the OD intensity measured. Input DNA should be relatively pure with 260/280 ratio >1.6 and can be diluted with water or TE buffer. The DNA amount can range from 20 ng to 200 ng per reaction. However, we recommend using 100 ng of DNA, which is the optimized input amount for the best results. DNA can be isolated from any species such as mammals, plants, fungi, bacteria, and viruses in a variety of forms including, but not limited to, cultured cells, fresh and frozen tissues, paraffin-embedded tissues, plasma/serum samples, and body fluid samples. Both single stranded DNA and double stranded DNA with a size of 200 bps to full length is suitable for use. *Spin the solution down to the bottom prior to use. Note: The NC is unmethylated DNA containing 0% of 5-methylcytosine. The PC is methylated DNA containing 5% of 5-methylcytosine. Chatterjee N et. al. (March 2019). Multi-generational impacts of organic contaminated stream water on Daphnia magna: A combined proteomics, epigenetics and ecotoxicity approach. Environ Pollut. 249:217-224. Hughey CC et. al. (February 2019). Dysregulated transmethylation leading to hepatocellular carcinoma compromises redox homeostasis and glucose formation. Mol Metab. Sodagam L et. al. (February 2019). Phytochemicals Rosmarinic Acid, Ampelopsin, and Amorfrutin-A Can Modulate Age-Related Phenotype of Serially Passaged Human Skin Fibroblasts <i>in vitro</i>. Front Genet. 10:81. Luo G et. al. (February 2019). DNA Methylation Regulates Corneal Epithelial Wound Healing by Targeting miR-200a and CDKN2B. Invest Ophthalmol Vis Sci. 60(2):650-660. Ma Y et. al. (January 2019). Changes in DNA methylation and imprinting disorders in E9.5 mouse fetuses and placentas derived from vitrified 8-cell embryos. Mol Reprod Dev. Suarez-Ulloa V. et. al. (January 2019). Seasonal DNA methylation variation in the flat tree oyster Isognomon alatus from a mangrove ecosystem in North Biscayne Bay, Florida Journal of Shellfish Research. 38(1):1-10. Németh CE et. al. (January 2019). Decreased Nuclear Ascorbate Accumulation Accompanied with Altered Genomic Methylation Pattern in Fibroblasts from Arterial Tortuosity Syndrome Patients. Oxid Med Cell Longev. 2019:8156592. Cramer T et. al. (December 2018). PARP Inhibitor Affects Long-term Heat-stress Response via Changes in DNA Methylation. Neuroscience. 399:65-76. Li R et. al. (December 2018). Effect of Jieduquyuziyin prescription-treated rat serum on MeCP2 gene expression in Jurkat T cells. In Vitro Cell Dev Biol Anim. 54(10):692-704. Yang Q et. al. (December 2018). Intermediate-term memory in <i>Aplysia</i> involves neurotrophin signaling, transcription, and DNA methylation. Learn Mem. 25(12):620-628. Ji X et. al. (November 2018). The collaborative effect of Chlorella vulgaris-Bacillus licheniformis consortia on the treatment of municipal water. J Hazard Mater. 365:483-493. Sant K et. al. (November 2018). Methods for Analysis of DNA Methylation Toxicoepigenetics. 2019:347-377.
et. al. (October 2018). Early-life epigenetic changes along the corticotropin-releasing hormone (CRH) gene influence resilience or vulnerability to heat stress later in life Molecular Psychiatry. Ye Y et. al. (October 2018). Bisphenol A exposure alters placentation and causes preeclampsia-like features in pregnant mice involved in reprogramming of DNA methylation of WNT2. FASEB J. :fj201800934RRR. Tagliafierro L et. al. (October 2018). Multiplication of the SNCA locus exacerbates neuronal nuclear aging. Hum Mol Genet. Cui P et. al. (September 2018). Hypothalamic DNA methylation in rats with dihydrotestosterone-induced polycystic ovary syndrome: effects of low-frequency electro-acupuncture. Exp Physiol. Sidorkiewicz I et. al. (September 2018). Cellular, transcriptomic and methylome effects of individual and combined exposure to BPA, BPF, BPS on mouse spermatocyte GC-2 cell line. Toxicol Appl Pharmacol. Cui S et. al. (August 2018). Folic acid modulates VPO1 DNA methylation levels and alleviates oxidative stress-induced apoptosis in vivo and in vitro Redox Biology. Jarome TJ et. al. (July 2018). EZH2 Methyltransferase Activity Controls Pten Expression and mTOR Signaling During Fear Memory Reconsolidation. J Neurosci. Hughey CC et. al. (June 2018). Glycine N-methyltransferase deletion in mice diverts carbon flux from gluconeogenesis to pathways that utilize excess methionine cycle intermediates. J Biol Chem. Jia YL et. al. (May 2018). CRISPR/Cas9-mediated gene knockout for DNA methyltransferase Dnmt3a in CHO cells displays enhanced transgenic expression and long-term stability. J Cell Mol Med. Guo T et. al. (May 2018). SNHG6 acts as a genome-wide hypomethylation trigger via coupling of miR-1297-mediated S-adenosylmethionine-dependent positive feedback loops. Cancer Res. Li J et. al. (May 2018). 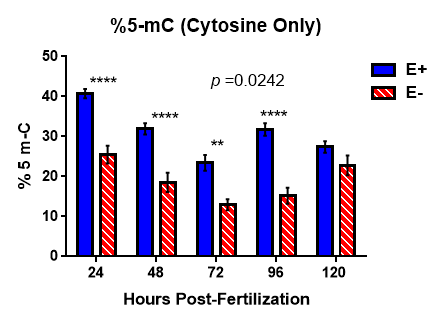 Folate treatment of pregnant rat dams abolishes metabolic effects in female offspring induced by a paternal pre-conception unhealthy diet. Diabetologia. Li Y et. al. (May 2018). Temporal efficacy of a sulforaphane-based broccoli sprout diet in prevention of breast cancer through modulation of epigenetic mechanisms. Cancer Prev Res (Phila). Royston KJ et. al. (April 2018). Withaferin A and Sulforaphane Regulate Breast Cancer Cell Cycle Progression through Epigenetic Mechanisms. Exp Cell Res. Pathak S et. al. (April 2018). DNA methylation of the BRD2 promoter is associated with juvenile myoclonic epilepsy in Caucasians. Epilepsia. Toghill BJ et. al. (March 2018). <i>SMYD2</i> promoter DNA methylation is associated with abdominal aortic aneurysm (AAA) and <i>SMYD2</i> expression in vascular smooth muscle cells. Clin Epigenetics. 10:29. McKee SE et. al. (February 2018). Perinatal high fat diet and early life methyl donor supplementation alter one carbon metabolism and DNA methylation in the brain. J Neurochem. Tavakoli Shirazi P et. al. (February 2018). Folate modulates guanine-quadruplex frequency and DNA damage in Werner syndrome. Mutat Res. 826:47-52. Maiuri AR et. al. (July 2017). Mismatch Repair Proteins Initiate Epigenetic Alterations during Inflammation-Driven Tumorigenesis. Cancer Res. 77(13):3467-3478. Yangmin Wen et. al. (June 2017). Isolation of an indigenous Chlorella vulgaris from swine wastewater and characterization of its nutrient removal ability in undiluted sewage Bioresource Technology. Koestel ZL et. al. (December 2016). Bisphenol A (BPA) in the serum of pet dogs following short-term consumption of canned dog food and potential health consequences of exposure to BPA. Sci Total Environ. Khot VV et. al. (September 2016). Variable Methylation Potential in Preterm Placenta: Implication for Epigenetic Programming of the Offspring. Reprod Sci. Determination of seasonal changes in DNA methylation levels in gill tissue from the flat tree oyster Isognomon alatus sampled in the North Biscayne Bay, Florida. Flat tree oysters (I. alatus) were collected monthly over a 12-month span from ten distinct sites across North Biscayne Bay in North Miami, FL. Dissected gill tissue from five individual oysters per site and per month were pooled and genomic DNA extracted following an isopropanol-mediated method (Fernandez-Tajes et al. 2007). Global Methylation was measured using 100 ng of isolated DNA following the manufacturer’s protocols. Results across replicates were generally okay. Not too many outliers were detected. We noticed that the kit reads methylation levels of intact and fragmented genomes as a few of our samples were slightly degradated but, still, the obtained results were consistent also in those samples. The manual is also very detailed. Overall, we are satisfied with the perfomance of this kit and plan to order it again anytime soon. Determining differences in global DNA methylation in zebrafish (Danio rerio) embryos spawned from adult fish maintained on a vitamin E sufficient (control) vs. vitamin E deficient diet. Data analyses with % 5m-C calculated according to P-1030 instructions; graphs and additional statistical analyses performed used GraphPad Prism 6.0 software. 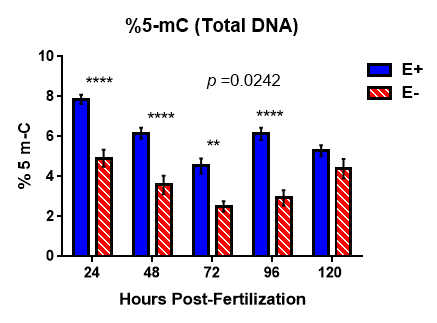 Global DNA methylation in E-sufficient (E+) vs. E-deficient (E-) zebrafish embryos over 120 hours post-fertilization (hpf); n= 15 embryos/sample; 4 replicate samples per group at each indicated age. p values from 2-way ANOVA with Tukey's post-test for multiple comparisons; ** p<0.01;**** p<0.0001 between groups at indicated age. This was simple to use on the first try; product design and speed of protocol was much improved from the previous P-1034 model (used by another researcher at my institution). How friendly was the user guide? Most sections were easy to follow, and important protocol notes were highlighted or italicized for emphasis. How professional was the appearance and presentation of the product? The product was well organized and all components were clearly labeled. How would you rate the overall product? This product was well designed and easy to use, assuming one reviewed the protocol before beginning the experiment. Well-written protocol, straight-forward directions, and no "surprise" steps included out-of-order. All helpful details regarding each step were presented in a logical manner. There were sufficient reagent amounts to complete experiments with the total number of samples advertised. The actual plate with plastic wells was flimsy and it was difficult to extract the well rows without breaking them. Also, the instructions to mix standards (for quantification purposes) in 1.5 mL tubes could have been improved by instructing smaller tubes (i.e. microtubes) since the standard series volumes were so small. The micro-liter amounts got "lost" in 1.5 mL tubes.